1000W solar grid tie inverter with power limiter provent extra power to grid, pure sine wave output, mppt solar grid tie inverter. 1:System without the Grid Tied Limiter. The grid tied inverter feeds all of the power available from the solar panels(A1) to the AC load. (A2), all excess power is then exported to the Grid(A3). If the grid fails(Grid V=0v)then the grid tied. Inverter will turn off. When the Grid comes back on line the grid tied inverter will export power back. If the grid tied inverter is producing less power than what is required by the AC LOAD then the. Load will be supplemented with the power from the Grid(B1). If the grid tied inverter is producing more power than what is required by the AC LOAD then. The excess power will be exported to the Grid(A3). Power Meters(Except smart meter)are not aware of the direction of power flow. Charge for power in both directions and this is a problem. The Grid Tied Limiter will fix this problem by preventing the export of power to the grid(A3). Displays the Utility Power (grid power), Inverter Power (GTIL power), Utility KWH and Inverter KWH. Two (2 pcs) – Connects the AC output of GTIL to LM. Can be plug in either receptacle. Power per receptacle is 2kw or a total of 4kw GTIL can be plugged in the two receptacles. Output of GTIL can also be directly connected to the grid or through the house convenient outlet. 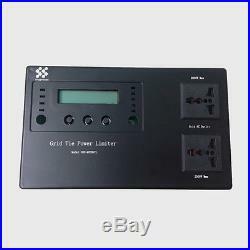 But the LM LCD will no longer display the Inverter Power and Inverter KWH. Connects/clamps to one hot wire after the Main Circuit Breaker. Converts the magnetic field created. By the flow of current in the wire into small AC voltage and current which is proportional to the power that passes through the wire. Clamp sensor AC signal input connects the clamp sensor AC signal to the LM module. Limiter Module AC power input- Connects AC power from grid to energize the wattmeter and the Limiter Circuit. Do not connect to AC grid if terminal block is wired or connected to the GRID. Only use when the GTIL is remotely located or the user decided to connect the AC output of GTIL to other grid location within the user premises. Terminal Block- AC power to Grid. The AC output of the GTIL is plugged to the LM receptacle in order for the LCD to display the GTIL. Output in watts and KWH. The GTIL output is connected to the Grid through the Terminal Block. Connecting the terminal block to AC grid also powers the wattmeter and limiter circuit. Limiter DC Signal Output, 2 pcs Connects the LM output signal to the GTIL signal input. Can connect to any of the signal output receptacle. We provide 3 connection diagrams for customer to choose. GTIL will only provide 3m signal cable. And sensor signal cable. If customer need to configurate the system same as the diagram 2 and. May cause bigger excess power. We have test it, as long as the cable is less than 30M, It will have no affect. Note: The Grid Tied Limiter cannot able to limit power 100% accurate, It will have some excess. Power send to the grid or supplement by the grid. But in most of the time, it will supplement by grid. The excess power will be about 10W. Models available for Masspower GTIL. 500W Grid Tied Inverter with power limiter Model SUN-500GTIL. 600W Grid Tied Inverter with power limiter Model SUN-600GTIL. 1000W Grid Tied Inverter with power limiter Model SUN-1000GTIL. 1500W Grid Tied Inverter with power limiter Model SUN-1500GTIL. 2000W Grid Tied Inverter with power limiter Model SUN-2000GTIL. Have given more than 3 negative or netural feedbacks during past 60days. Have received 3 or more negativeor netural feedback during past 60days. Have opened dispute twice in past 60days. We believe that all problems could be fixed by communication between buyers and sellers as long as both of us are honest and understanding. The item “Grid tie power limiter for SUN-500/600/1000/1500/2000G solar grid tie inverter” is in sale since Tuesday, May 26, 2015. This item is in the category “Home & Garden\Home Improvement\Electrical & Solar\Alternative & Solar Energy\Chargers & Inverters”. The seller is “sunhome910″ and is located in , . This item can be shipped to North, South, or Latin America, to all countries in Europe, to all countries in continental Asia, to Australia.